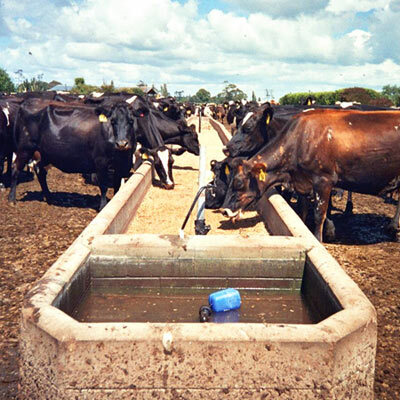 A feedpad is used for regular supplementary feeding and loafing of cattle on an area of land that is either formed with a solid foundation and/or concreted to establish a permanent facility. These pads are usually sloped to accommodate various cleaning systems to support cow alley washing. Some have the potential for the incorporation of roof structures or side walls. This stage is classified as a point source facility, which requires an appropriately designed effluent system and management strategies as cattle may occupy the facility multiple times each day for extended periods throughout the year. Concrete feed pads are not suitable for standing off cows for long periods of time. Opportunity to increase pasture production if pugging can be reduced. Opportunity to establish an effluent system that captures more effluent and manure which can be reapplied when soil conditions suit. Close proximity to feed bunkers + machinery to handle and supply a range of feeds. Given there are many different types of feedpad systems, careful consideration is needed to ensure the most appropriate system is chosen to suit the indended purpose.